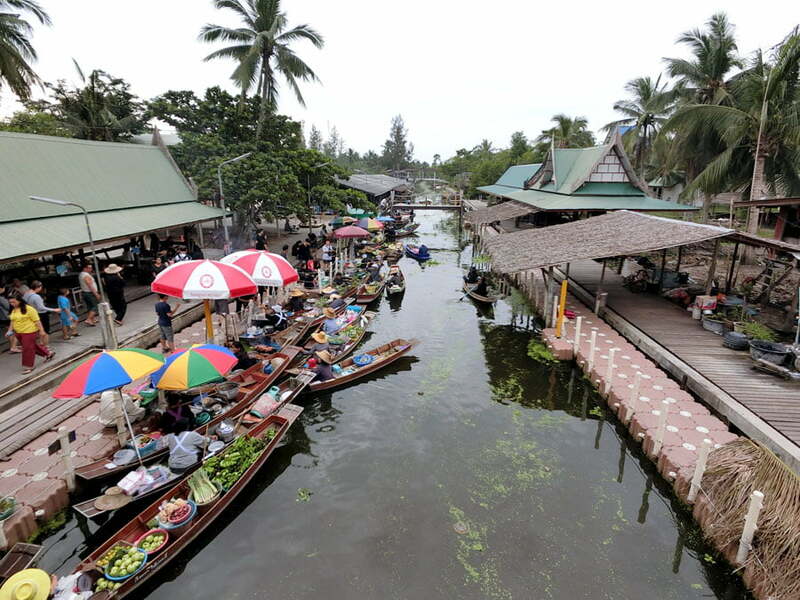 Get out of busy Bangkok and take a ride one-hour southwest to Amphawa in the Samut Songkhram province where you can enjoy a more laidback side of Thailand and witness some unusual Thai traditions. Here’s my guide about the things you can do in Amphawa and Samut Songkhram. It was refreshing to explore nearby spots that gave me a different experience of Thailand – thanks to Tourism Authority of Thailand who had invited us to witness the commemoration of the late Thai King’s birthday. Amphawa tends to be quite busy on the weekends because of its special markets and as a day trip option from Bangkok, so it is worth checking out Amphawa in the middle of the week before the weekend crowds arrive. 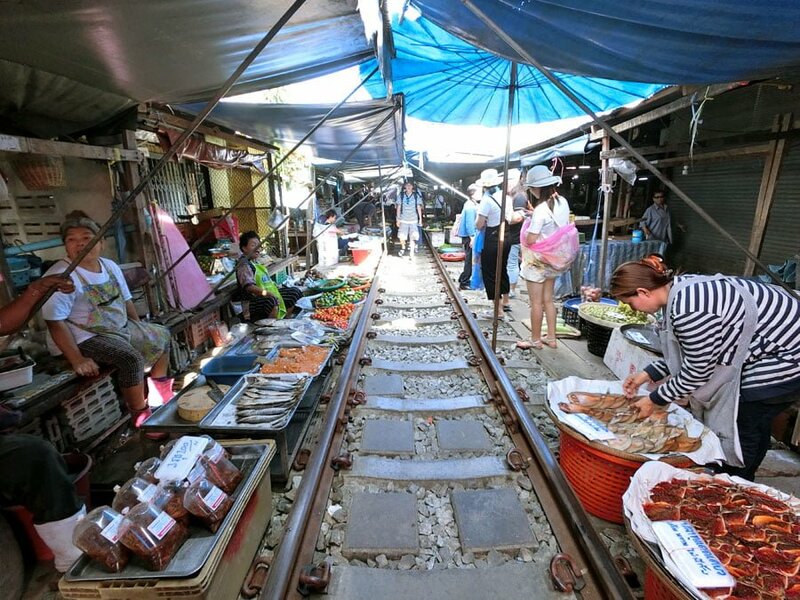 One of the things Amphawa is most famous for is the Maeklong Railway Market. What’s special about this market is that an active train track runs right through the center of the market – products and awnings extend right onto the train tracks most of the time, so the fun part is seeing what happens every time the train passes by. Yup, all those umbrellas and awnings come down and the tourists get shooed to the side and the train passes through reeeaaaaalllly close to you. Fun fact: In Thai, the locals know this market as Talat Rom Hoop which loosely translates into ‘Market Umbrella Close’, which is why it’s also known as the Umbrella Market. Awnings down, here comes the train! Timings: The trains move through the market 6 times a day, 3 departing Maeklong (0620, 1020, 1430hrs) and arriving at Maeklong (0945, 1345, 1822hrs). Check out this site for more detailed information. It’s pretty cheap (20THB is less than S$1!) in total but it looks like it would take the better part of a morning to accomplish. Another interesting market to check out in Amphawa are the floating markets – there are several floating markets that tourists like to visit, but I really liked Tha Kha Floating Market or Talat Nam Tha Kha, one of the smaller ones because it’s got more local flavour and was generally quieter than some of the others. 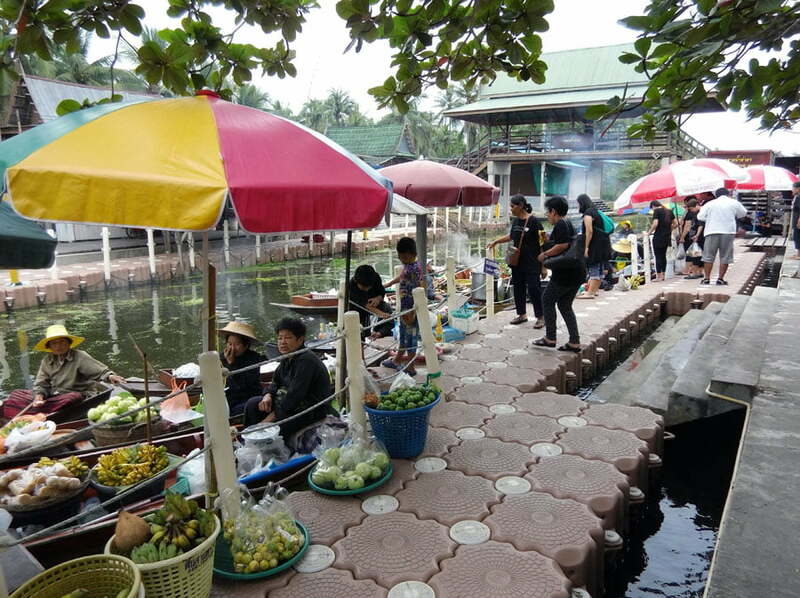 Floating markets mean that instead of physical stalls, everything is sold out of the slim wooden boats on the shore of the canal – step carefully on the floating pontoons and you can buy fresh produce or street food prepared right there for very cheap. Tha Kha is a regular market with over 100 years of farmers rowing down the river to sell their produce, so you aren’t going to get kitschy souvenirs here. 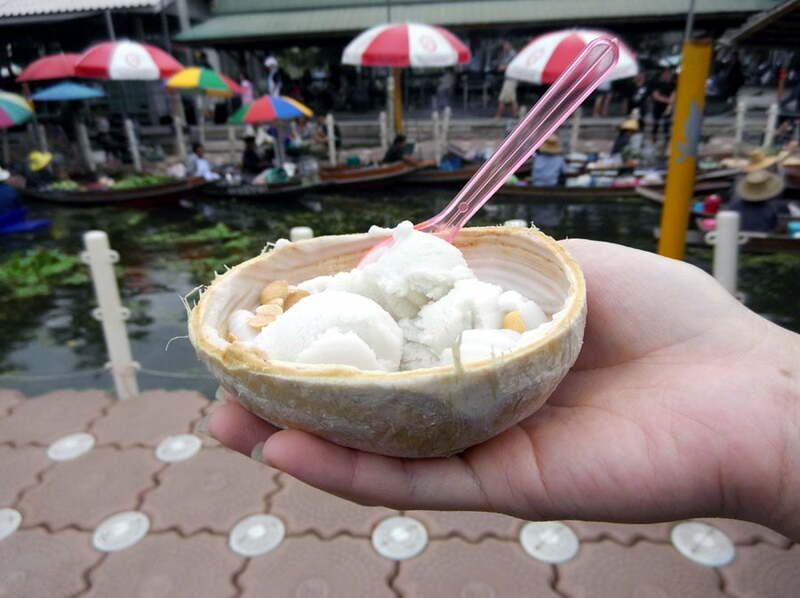 I had myself some coconut ice cream for 20 THB (S$0.80! ), yum! Opening Hours: The market only opens on weekends – Saturday and Sunday from 6am. Morning is the busiest when the weather is cool, and the boats start leaving as the midday heat takes over. Locals might offer to give you a boat ride along the river – we didn’t have time to do this but this account on Travelfish makes it sound pretty charming. If you rather not wake up too early, the Amphawa Floating Market is an afternoon market that sees more people and boats than the Tha Kha market. Here you can buy kitschy souvenirs – I got myself beer can and pencil point earrings as souvenirs, and there is of course street food in abundance. This… is one of the weirder things you can buy here – Stuffed fish keychains! You can also take a boat ride along the river, something nice to do in the evenings and apparently very popular for firefly appreciation. What I found interesting about Amphawa is that they placed a lot of focus on preserving their local cultural heritage, evidenced in the Amphawa Chaipattana Nurak project, a Royal project endorsed by the late King and the current Princess. You can read more about it here. We visited the Samut Songkhram Life Museum, a living museum where local craftspeople were demonstrating traditional crafts, like this little old lady who is apparently the last remaining person who knows how to weave this particular style of hat, as well as other ladies who wove roses and helmet-like hats out of pandan leaves. There were some exhibitions as well, but watching the craftspeople at work was definitely enlightening. Across the road is an outdoor section or Chaipattana Park that showcases traditional agricultural methods and architecture. Sometimes there are cultural performances as well – we didn’t see any unfortunately but we did see some traditional food prep. This conservation project also focuses on sustainability, and I do hope that it succeeds in preserving Amphawa’s traditional charm in the long term. I love all the windows that keep this house airy! Opening Hours: The Thai Tourism website says it is open every day, 8am – 5pm, but it probably is the most active on the weekends when the Amphawa Market is up and running. Admission is free. I’ve seen plenty of temples, but Wat Bang Kung is completely covered and encased in Banyan tree roots and really surreal looking, almost as if it popped out of a dream. This national archaeological site was once a spiritual centre for the navy in the late 1700s following the fall of Ayutthaya. Inside the temple is a Buddha statue covered in gold leaf, also known as Bot Prok Pho. Almsgiving is a Buddhist practice usually seen in the staunchly Buddhist countries – Luang Prabang is pretty famous for its morning ritual that I got to participate in, but almsgiving in Amphawa is a little different from the procession of monks you normally see because it happens by boat! It’s also a much more sedate affair as we had just one monk visit us and collect alms on behalf of his temple – I’m not sure if it was because our location was a bit quieter at Kanokrat Resort Amphawa along the Pee Lork Canal (off Mae Klong River). Have you been to Amphawa in the Samut Songkhram district? Tell me about what I missed. Thailand is definitely so much more than Bangkok – make sure to check out nearby Hua Hin or Ayutthaya as well. I was invited to Bangkok and Amphawa on a media trip with Tourism Authority of Thailand. All opinions are my own. The way of capturing the views are stunning. Everything about your experience sounded magical. Well thanks a lot. Now I have to reschedule my entire weekend to stop there on my way from Hua Hin to Bangkok. How can I not go?! haha! That train through the market looks insane. I’m so glad I saw this post before I left Thailand. well it’s kinda on the way between Hua Hin and Bangkok, I hope you enjoy your weekend there! I enjoyed this post, Jaclynn! In India, a train runs from Siliguri to Darjeeling and for a few metres it runs through markets. Your post reminded me of taking that train as a child. 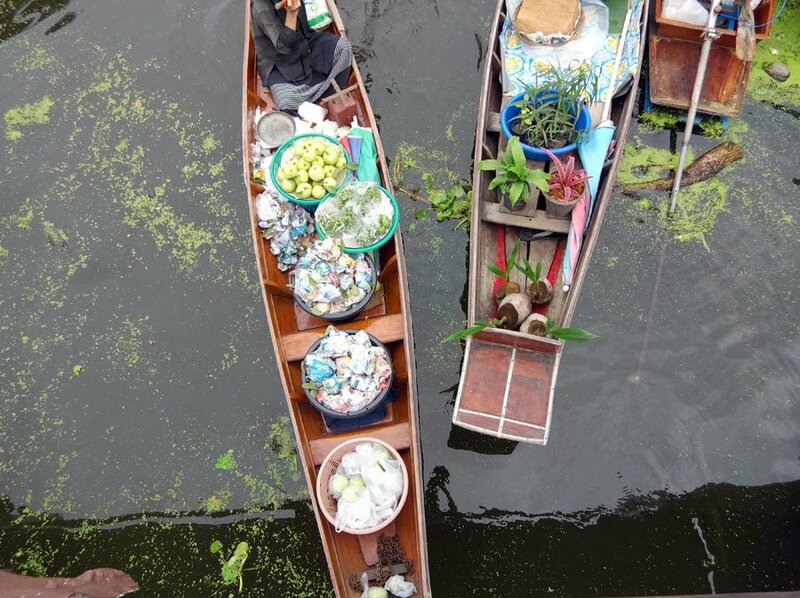 Floating markets have always fascinated me. Holy wow this is so much fun… I’ve been avoiding Thailand so far as I’m worried it’s too much of a mecca for tourism, but honestly this post has made me reconsider that. Thanks so much – I LOVE MARKETS! Thailand’s more touristy than other nearby countries, but I think there’s still quite a lot to see if you skip some of the tourist hotspots :) markets are great for the adventurous foodie! This is great, I have been meaning to go to Bangkok and I have seen/heard about the train and floating markets, didn’t realize it was so near by. Using this for my future plans for sure! Love this! I didn’t manage to visit the train market the last time I was in Bangkok as I was pressed for time, but this trip looked so fun! Are you allowed to touch the train though as it pass by? You probably could but I wouldn’t just because it might encourage other people to do so as well? There were a remarkable number of people around the track who didn’t seem to have any idea how close they were to the train’s path, and the shopkeepers do their best to keep everyone safe but apparently there have been incidents in the past, so I wouldn’t touch the train or get too close! Really interesting post – so useful you included those train times too, imagine turning up and missing seeing the train go past! I would spend hours photographing the floating market, you’ve captured it beautifully – looks like a beautiful adventure! I really enjoyed this post! I am planning my honeymoon, we will spend a few days in Bangkok so I’m looking for inspiration on day trips. We decided not to go see the islands and have a proper beach Thailand trip, but explore Bangkok and its surroundings instead. So this information was very good to read, I’m particularly intrigued by the train passing through the market! Oh so this is where this train is! I’ve seen videos before and now I finally know. The floating market looks adorable as well. Thanks so much for sharing this informative post. I love off the beaten path places like this.